- around 2000 natural monuments, including features of both animate and inanimate nature such as individual trees and tree clusters, paths and erratics, spring niches, postglacial forms (e.g. kames or morphological forms), and protected plants, e.g. the Oak of the Republic of Poland, St. Wojciech’s Stone, the Fairytale Cave, The Larch Hill (see beneath). - 5 natural and scenic complexes, designated to protect the nature and cultural scenery of exceptional value, including Messa Peat Bog, the Ryszka Valley, the Sobińska Struga Valley, the Prusina Valley, Słupski Gródek upon the Osa. 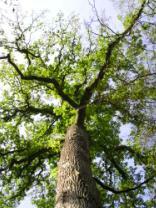 The nearly 400-year-old oak grew up surrounded by other trees, which gave him a slender, aerial look. It has reached a considerable size: it is 32 m high with the trunk circumference of 612 cm. The trunk has an 8-metre hollow, inhabited by bats in the summertime. Once it was inlayed with cement and asphalt, which were supposed to exert a healing effect on the tree, yet the result was the opposite. In 1994, the park employees removed the inlay and disinfected the interior with fungicide. At present the hollow is gradually decreasing. In the pre-war period, the oak served as a meeting point for people from Górzno, Lidzbark and the neighbouring villages, who gathered there for folk dances. Today the people of Lidzbark call the tree Jagiellon Oak (Dąb Jagiełły). It attracts hundreds of tourists and children on school trips. In the oak’s vicinity, especially attractive are equally impressive nearly 200-year-old pine trees. One of the biggest erratics, also known as the “devil’s boulder”. The stone is 3.8 m high, 8.8 m wide and its circumference totals 25 m. The legend has it that St. Wojciech stopped here to convert the heathen. The place, however, might have been used for non-Christian religious practices much earlier. The only cave in the Kuiavia-Pomerania region made in the moraine sandstone at the altitude of 90 m above sea level. It is 19 m long and consists of one chamber with several side recesses. It is adjacent to the 10-m long Fairytale Cave II and a smaller one, called Dziura z Filarkiem, which is 1.5 m long. 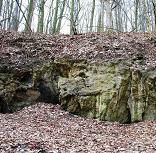 The caves were made as a result of sand depositing on the ground and washing out the deposit in the lowest part of the ravine slope in which they are located. The Larch Hill is among the most valuable and impressive natural monuments of the Kuiavia-Pomerania region. It is a cluster of 10 old larch trees, recognized as a natural monument in 1964. 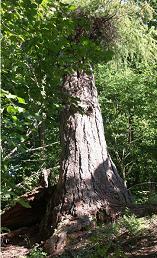 The trees are roughly 300 years old and their trunk circumference varies from 140 up to nearly 400 cm. in the Kuiavia-Pomerania region takes most possible forms except for national parks. According to the Nature Conservation Act, landscape parks are areas of natural, historic and cultural values, intended to preserve and popularize the values in conditions of balanced development. They are not excluded from economic use, yet the exploitation is restricted with a view to protecting the above mentioned values. The Kuiavia-Pomerania region's landscape parks form the basic level of the so-called large-scale environmental protection, aiming at the preservation of the habitat and species diversity and the protection of the nearly natural conditions for flora and fauna community development. They include areas of relatively low level of pollution on regional and national scale, which provides excellent conditions for agricultural production and leisure. Most of the protected areas are located in the north-west and north-east part of the region, and along the Vistula Valley. The region can boast nine landscape parks altogether, which cover a total area of 232 762.8 ha, i.e. 13% of the region (8% of the total area of Poland). These include the Brodnica Landscape Park, the Gostynin and Włocławek Landscape Park, the Górzno and Lidzbark Landscape Park, the Krajna Landscape Park, the Gopło Millenium Park, the Tuchola Landscape Park, the Wda Landscape Park and the Complex of Chełmno and Vistula Landscape Parks. Read more on the landscape parks here. The large-scale environmental protection is a particularly effective method of practical nature conservation in Poland and the world. To counteract the negative phenomenon of nature fragmentation, the 'Ecological System of Protected Areas’ project (pl. ESOCh) has been introduced, envisaging joining relatively well-preserved and rich ecosystems by means of ecological corridors. The corridors allow fauna and flora migrations and serve as inanimate matter passages. The Kuiavia-Pomerania region is located within EKONET-POLSKA, a national ecological network, consisting of several key areas, biocentres and ecological corridors. It encompasses 4 key areas, two of which are of international importance. The region is divided by a wide international ecological corridor in the centre. It runs through Toruń-Eberswalde Proglacial Stream Valley and the Lower Vistula Valley, where the Landscape Park of the Lower Vistula Valley, a number of protected landscapes and several nature reserves are located. They are the most important bird and plant migration routes in the region and some of the most important in Europe. The moist and wet habitats in the large valleys provide excellent conditions for aquatic and march birds nesting, including endangered species. A significant geomorphologic diversity is conducive to biotope diversity and species richness, while opening the valleys enables long-distance flora and fauna migrations. There are both lowland species and mountain plants, either foreign or domestic. The Kuiavia-Pomerania is intersected by a number of local ecological corridors, two of which run through the north-west part of the region: along the River Wda Valley and through the River Brda and Koronowo Reservoir. Other local ecological corridors include the whole of the Drwęca Valley and, in the south, a number of finger lakes in the Gąsawka, Wełna and Noteć Valleys in Gniezno Lakeland, as well as the Skrwa Valley in Płock Upland. Natural reserves are different size areas excluded from economic use in order to preserve their precious and largely natural ecosystems, with little or no human interference, and rarely the flora and fauna sites or elements of inanimate nature. In the Kujavian-Pomeranian region, most of them are partial reserves, where a number of economic interventions are possible or recommended, such as forest nurturing, intended to maintain the required condition of the protected area. – halophyte reserves (1.8 ha). – "Gopło Millenium Park”, with aquatic and marsh bird habitats. There are 34 areas of protected landscape in the Kuiavian-Pomerania region, covering a total of 338 504.20 ha. They are characterized by outstanding natural beauty and diverse ecosystems, especially important for satisfying the mass tourism demands or the existing or reconstructed ecological corridors. As is the case with landscape parks, administering these areas is subject to little restrictions. Here, both natural and cultural landscape elements are protected. Special care is devoted to water and waste management, as well as the drainage systems. In the Kuiavian-Pomeranianregion, the majority of protected landscapes are located in the Valleys of the Vistula, Brda, Drwęca and Osa, and the Tuchola Forest, for example, "Koronowo Reservoir”, "The Peat, Lake and Forest Area of Zgniłka, Wieczno and Wronie”. Nature monuments are single or collective formations of animate or inanimate nature with peculiar scientific, historic, commemorative and scenic values. They are characterized by individual distinctive features differentiating them from other formations. The region has roughly 2 000 nature monuments, such as single trees and tree clusters, roadside paths, erratics and the like. They are scattered unevenly across the region and are mostly found in the districts of Świecie, Bydgoszcz, Tuchola, Nakło, Grudziądz and Inowrocław. - Old Ślesin (the borough of Nakło).